Consumer confidence ticked up in the first quarter of this year by a mere percentage point. 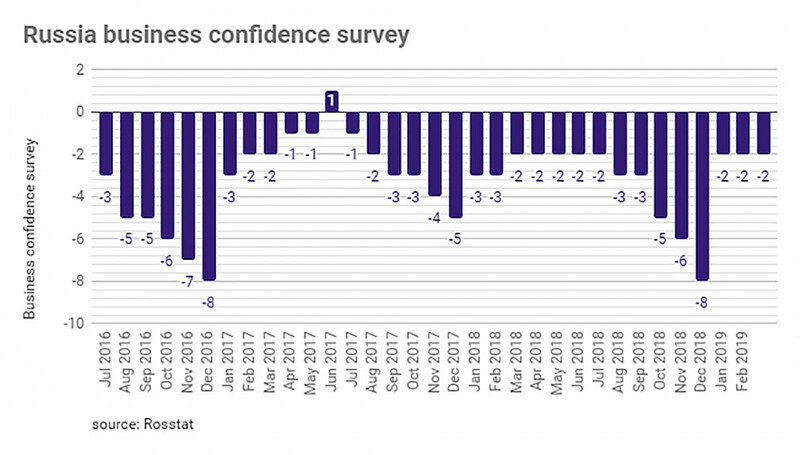 The index essentially only rose from “really despondent” to “little hope things will get any better.” On the other hand, business people in Russia became the most optimistic they’ve been in over two years. 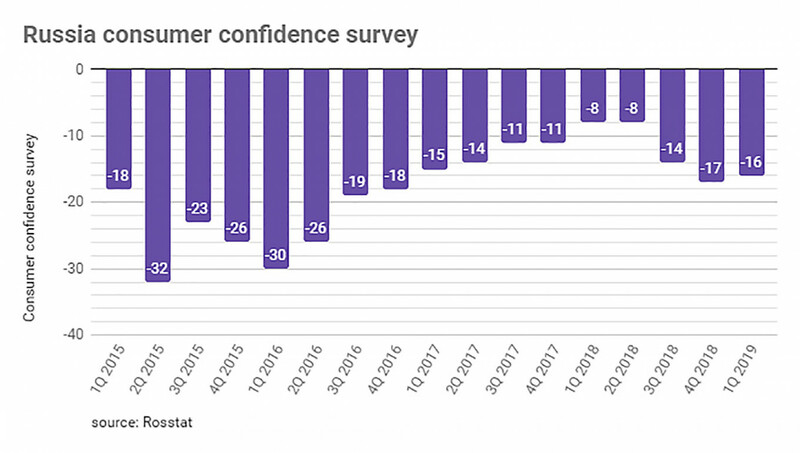 The Russian state’s quarterly survey of consumer confidence rose from -17 percent in the last quarter of last year to -16 percent at the end of the first quarter of this year. That is a far better showing than the low of -32 percent recorded in the second quarter of 2015 in the midst of Russia’s “silent crisis.” However, following the growing optimism that spread in 2017, the population’s confidence level suffered a setback in 2018, falling to -17 percent at the end of the year. One reason for the decline in sentiment was the total lack of any trickledown effect. Rosstat reported a surprise and controversial upgrade to growth of 2.3 percent in 2018 — a result it confirmed this week in a release of revised statistics — and companies and banks last year posted some of their strongest profits in several years. 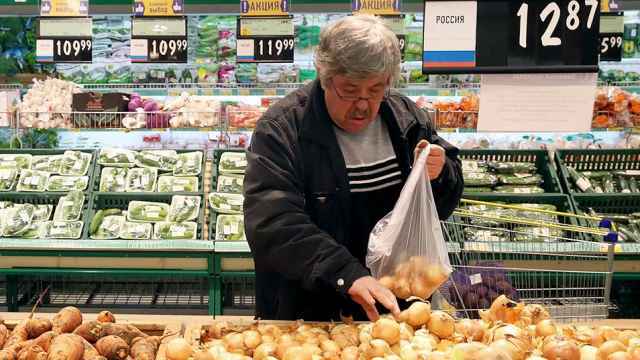 But real incomes in Russia fell again slightly in 2018, meaning they were down for the fifth year in a row. 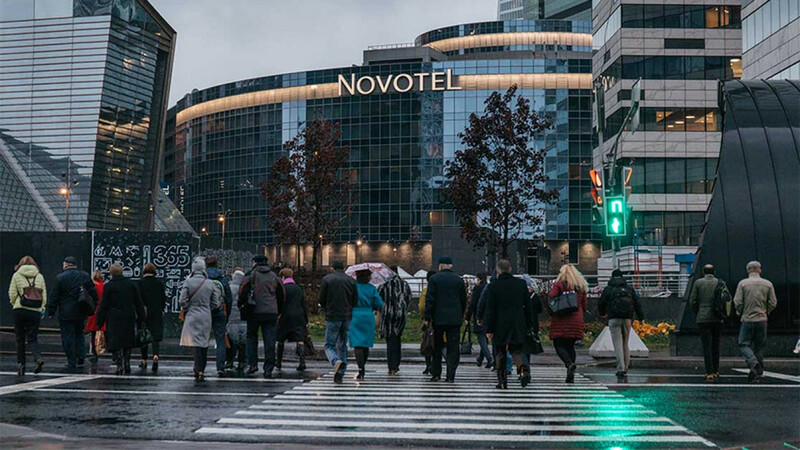 That is reflected in poor retail turnover numbers and a growing desire to emigrate, Vedomosti reported on April 3. That desire has reached its highest level in a decade. The share of people who think that recent economic changes have been positive fell to 11 percent in January-March from 12 percent in October-December 2018, Rosstat reported, while the share of negative estimations went down to 45 percent from 46 percent, and the share of neutral estimations rose to 43 percent from 42 percent, Rosstat said, as cited by Prime. Those figures stand in stark contrast to the last corporate profit numbers Rosstat reported. They were off last year’s highs but were recorded as the best set of results seen in three years. Confidence among Russia's companies has improved dramatically in the last year. It is currently only at -2 percent, after something of a wobble last autumn. Companies have been more active in raising money from bond and equity markets. Witness the string of secondary public offerings (SPOs) and Eurobond issues. 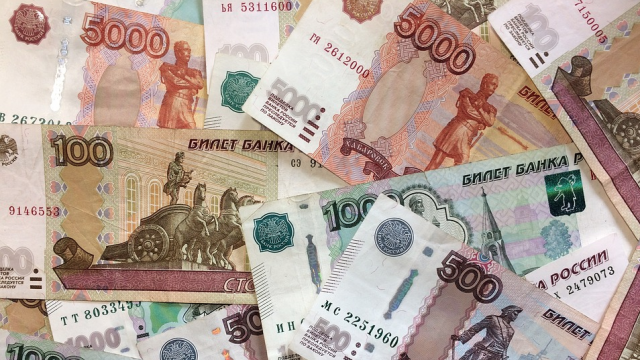 Russian entities raised bond issues worth $8.3 billion in the first quarter, mostly in March. They included the state’s $3 billion and €750 million Eurobond issues last month — the biggest in six years. Likewise, as bne IntelliNews has been reporting, there has been a healthy crop of SPOs and equity placements this year as shareholders tap the improving sentiment to either take some cash out or raise investment capital. Featuring among the most recent deals was the decision of the owners of Polyus Gold to sell a 3.5 percent stake and take out $390 million for themselves this week. Likewise, multi-industry conglomerate AFK Sistema’s pharmaceutical holdings and transport company RusTransCom have both announced IPO plans in the past few days. It's the same story in the banking sector. After an annus horribilis in 2017 for bankers, when several of the leading commercial banks collapsed, nearly sparking a systemic meltdown, 2018 turned out to be a good year. Banks literally turned tenfold more profit, at 1.3 trillion rubles in 2018, than they did in all of 2016. In that threadbare year, Sberbank was alone in reporting some profit, and that was more than the aggregate profit of the entire sector. 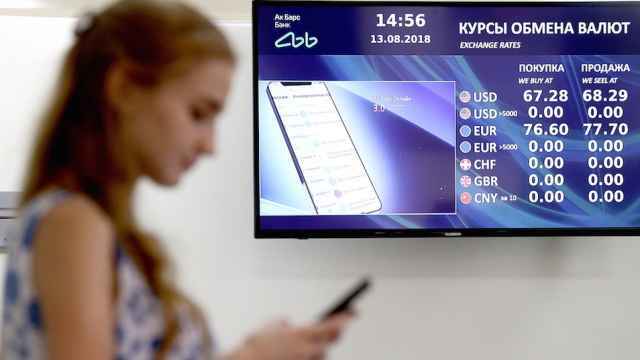 In reality the banking sector’s profit last year was even higher at 1.9 trillion rubles, if the results of the troubled commercial banks the Central Bank of Russia (CBR) was forced to take over in 2017 are counted out. This year the results will be even better and Sberbank says it hopes to be earning 1 trillion rubles in profit by itself in the next few years. The money many companies and banks are making is, however, yet to translate into more growth. Last year’s 2.3 percent growth is seen as an aberration and the official Economy Ministry forecast for 2019 is a mere 1.3 percent. Growth is only expected to take off in 2021 when the massive 25.7 trillion rubles ($390bn) in investments planned for the 12 national projects starts to have an effect, with growth forecast to rise to 3 percent. However, the first signs of change appeared in March when both Russia’s manufacturing PMI index and industrial production delivered encouragingly good results. The PMI index, a forward looking indicator based on interviews with a large panel of business owners, climbed to its highest level since January 2017. It registered 52.8 in March, up from 50.1 in February, a figure that showed almost no change in January. IHS Markit, which compiles the Russia Manufacturing PMI survey, gave the latest data in a press release on April 2. “March data signalled a further improvement in the health of the Russian manufacturing sector. The solid overall expansion was supported by significant acceleration in rates of output and new business growth,” Markit said in its press release. “Subsequently, business confidence improved in March and the degree of optimism reached a fresh series high,” Markit added. What was especially encouraging about the PMI March result was that the growth was coming from the manufacturing part of the economy. For the most part over the past two years, it has been the services PMI that has held the overall PMI index number up. If the latest trend persists in the coming months, the cheering conclusion would be that growth was now based on a more balanced mix of drivers. And there are some grounds for optimism that this may happen given that Russia's industrial output growth surged to 4.1 percent year-on-year in February, following on from the 1.1 percent posted in January, which surprised analysts. Russia’s industrial production was in the positive figures for most of last year but industrial production was spluttering and failed to gather any momentum. Still, none of this helps the poor consumer. Few of these corporate profits and little of the IPO good news as yet trickles down to any positive effect for the man in the street. 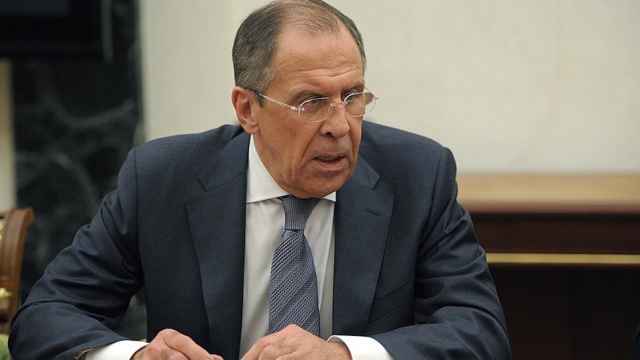 Russian President Vladimir Putin is clearly well aware of this and attempted to address some of the falling quality of life issues in his state of the nation speech in February. It came across as a Santa’s sack of social spending and public sector wage hike promises.